Many attractions as popular with visitors as the Museum are, by definition, seasonal places. For most, winter time sees a quieter period and indeed, we have fewer visitors than at the peak of the summer and school holiday periods. However, we are far from being quiet. Here’s a quick roundup of some of the things you may not have spotted behind the scenes this winter so far. Our Aircraft Engineering team are the people who bring our aircraft to life. You’ll see them at our events each year as our live aircraft thrill our visitors with the sights, smells and sounds of historic aviation. During Winter, work still continues and they brace themselves for the cold winds and rain in order to maintain engines and carry our major servicing whilst trying to keep the historic aircraft protected from the worst weather. Behind the scenes there’s also the Operational Management Team, a group of highly professional people working away at all the event planning detail throughout the year, and especially the winter period. They ensure that all the preparations, the organisating, the “dotting of “i’s” and crossing of “t’s” are co-ordinated and in place, ready for the next busy year. Amongst this work, they are planning logistics, anticipating catering needs, negotiating with air forces and working with the media and tourism organisations to create and promote nationally and internationally, our on-site events and our outreach projects. Our events team are already planning the fine logistical details for 2018’s events, and some even two or three years away, to be sure that when the day comes, everyone can enjoy a great day out and our engineers can concentrate on the job of thrilling our visitors. Our BE 2 fighter biplane was built as an authentic recreation some time ago. 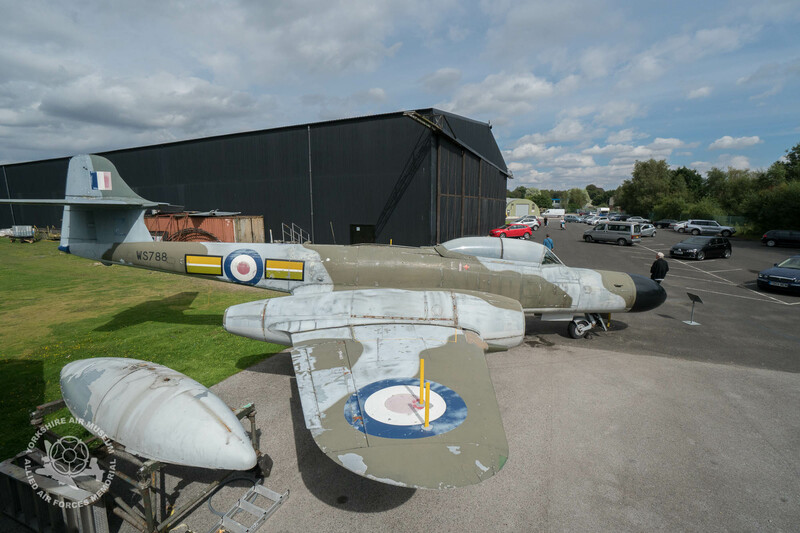 In late summer, Museum Heritage Manager, Gary Hancock conducted a survey of the airframe as we felt that, with RAF100 celebrations coming in 2018, the aircraft would benefit from some restoration. Deeper inspection led us to the conclusion that parts of the aircraft were very sound, but others needed restoration work and also some updating to be more historically accurate in the light of newer information. The BE2 is now completely stripped and undergoing a total transformation in readiness for 2018. Meteor NF14 Night Fighter Work. Summer visitors to the Museum will have seen the dramatic progress being made to our Meteor by a team of volunteers lead by Graham Buckle. The aircraft is now indoors for the winter as the team forge ahead with returning this rare and significant aircraft to it’s original specification. Everyone keeps asked what the colour scheme will be, but Graham has sworn everyone to secrecy as to which version of the classic jet’s colours will be applied when the time comes. On 28 November 2017, French Ambassador to the UK Jean-Pierre Jouyet was invited to Buckingham Palace by Her Majesty The Queen to formally present his credentials. Credentials, also known as “letters of credence”, refer to the formal documentation accrediting an Ambassador as head of a diplomatic mission. These letters, signed by the President of France, are presented to the Head of State of the receiving country. In the UK, this is done in a formal ceremony during which Her Majesty The Queen personally receives the heads of a diplomatic missions. The Yorkshire Air Museum was invited by the French Embassy to be part of the day of the official presentation of the Letters of Credence to Her Majesty the Queen. We were truly honoured and delighted to be invited and to represent the two French Squadrons of RAF Bomber Command, who were based at RAF Elvington during World War Two. We had a wonderful mid week visit by a Cumbrian primary school recently. They visited on one of Yorkshire’s more challenging weather days but despite that they children had a wonderful time. Here’s the review the group leader was kind enough to post to our Trip Advisor page, which our team of volunteer guides were really pleased to read. “We visited here as part of a two day residential to York from Cumbria as a culmination of our World War Two topic. It was the highlight of the trip for the children and staff alike. The staff could not have been more welcoming or friendly and all facilities for the group were excellent. There were so many thoughtful touches such as a ‘ration’ of sweets for each child and even a personalised sign waiting for us. David had the children spellbound by his tales of life during the war. I was especially impressed by how he tailored his talk to what the group was interested in. David was very knowledgable about many areas in the war and could convey this is in a captivating, child friendly way. We all learned something,including their teacher with a History degree! We could have stayed all day chatting with David but it was lucky we didn’t as we would have missed the most well thought out and structured activity I have come across on a school trip. The children learned to be paratroopers. It was very atmospheric being in the actual plane and using the same routine and drills. Once the children had done the activity the audio was especially moving. I have a very jealous husband who would have loved to have done this activity! The December issue of Flypast Magazine carries a free copy of the 2018 calendar. This year, the Museum sponsored the production of the FlyPast calendar and each month shows a different aircraft from the Museum’s collection. Currently available from retailers everywhere, Flypast is one of the largest aviation enthusiast magazines globally, with a print run of over 64,000 each month. Be sure to pick up your copy to enjoy a different Yorkshire Air Museum aircraft each month in 2018. Our Museum Collections Department helped a small team of Italian aviation archeologists in their quest to contact relatives of a World War Two Spitfire pilot who had been killed in a crash in 1945. The Yorkshire Post covered the story and the quest to find the relatives of Warrant Officer John Henry Coats from York. Our archives were able to provide additional background information to help the Italian investigators learn more and it is hoped that a memorial will be erected in his memory in Italy. Most of the buildings at the Museum date back to World War Two. Like many buildings hurriedly erected in wartime, speed was of the essence and few people must have thought that, seven decades later, they would still be standing. This means that maintenance of these old structures, many of great significant historically, becomes a top priority each winter, so Site Manager, Karl Bullock and his team have been hard at work with a list of tasks large and small to ensure that the Museum is in perfect shape ready for another record breaking season in 2018. Together with the arrival of the Dassault Mirage IV this spring, the Museum is becoming increasingly famous as a filming location for television products. In 2017, the Museum featured in no less than twenty seven productions. Some of these were actual news items about the Museum itself, while on others we play a supporting role, working with production companies to create engaging, historically accurate features that you will see broadcast both this year 2018 and beyond. Don’t forget, we are open all year round, closing only for Christmas Day, Boxing Day and New Years Day. Why not take the opportunity to see the Museum in the winter months and meet our team of volunteer stewards, guides and engineers? Long time supporter via Vivian Bairstow.